Jonathan's Birding Blog: What's that Black-headed Gull mobbing?.. an OSPREY!!! What's that Black-headed Gull mobbing?.. 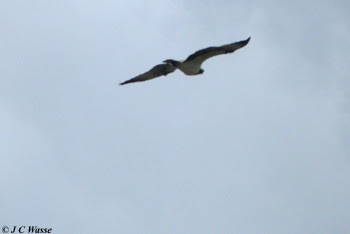 an OSPREY!!! Walking back down the river wall a couple of 100 yards from the visitors centre at Rainham Marshes RSPB. We got split up into two groups on this last part of the circuit due to different pacing, the significance of this was that all of a sudden all hell was let loose. I picked up a Black-headed Gull mobbing a bigger brown bird about 20 feet above the Thames just off the mud bank and say at the same distance to the visitors centre. 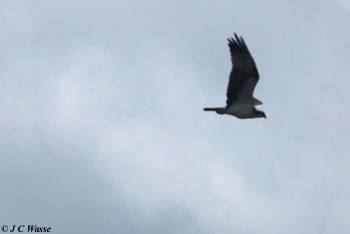 The target of its displeasure was an Osprey! We had cracking views as it flew past us heading upriver before turning north over the reserve. We tried to shout to our friends in front in vain, but unknown to us and equally unknown to them was that both parties had picked up the bird at the same time as transpired from rushed phone calls. The cracking fish eater departed high to the NE and I believe several birders and visitors connected with the Osprey thanks to the local radio network kicking in. A couple of record photos below.